Animal Crossing first broke ground on the GameCube, bringing us in the west a simulation experience unlike anything else. Fast forward over ten years, and we have already seen two more installments, with Animal Crossing: New Leaf ready to give us a dose of Nook and company for a whole new generation. This time around, you take the role as Mayor of your very own community, tasked with customizing a town to fit both your own and the many fuzzy inhabitant’s needs. Does this portable installment stand above it’s predecessors, or does this “New Leaf” wilt fresh off the train? Let’s find out. Animal Crossing: New Leaf does not have a story in the traditional sense. Just like the rest of the franchise, this game lets the villagers, event cycles, and world work around you as the player, which means you make your own narrative given. I know that might be confusing to some, but it all comes together as you play. Instead of giving the player a five to ten hour narrative, New Leaf takes weeks, months, or even years to squeeze out all of the joy inside. Each villager have their own little stories, habits, catchphrases, and quirks that make them genuinely interesting to interact with, and interaction is rewarded with town growth. 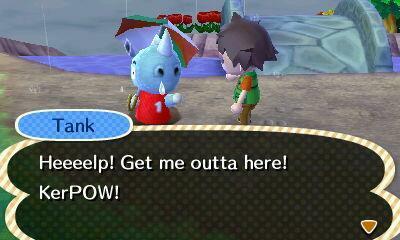 As an example, my first few days were highlighted by my jock of a rhino neighbor named Tank. A sweet little rabbit named Gabi invited my character over to her humble little home, and Tank was not too excited to see his Mayor spend time with another species. Every time he seen me out running around, he would make it a point to run up and let me know of his jealous ways, eventually inviting me over to see his place. Well, I forgot to show up that night, and he did not let me forget it the next day, and was rather bitter until he received the letter I wrote him – which he proudly showed off with glee once he received the mail later in the week. 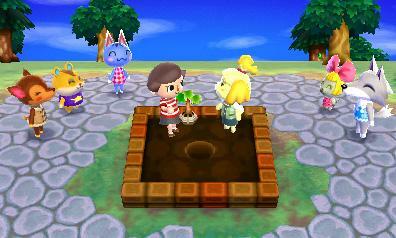 That is just one charming little story of MANY I have after spending over three weeks with New Leaf, and with everyday comes new opportunity to play hide and seek, dance in clubs, and partake in numerous other activities with these lovable animal residents that make what would be an otherwise stale experience into a rich, meaningful affair filled with memories and charm. 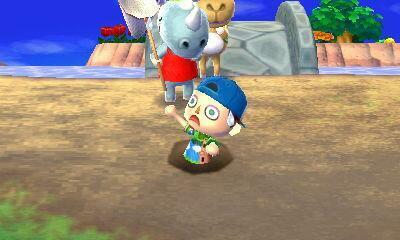 As you see, some villagers are rather cruel. There are not many games out there that let the player get a chance to pave their own road to success, but that is exactly the product that New Leaf is. Everyday sees new opportunities to go out on an adventure or make a change that all of your residents and visitors alike can enjoy, and the event and holiday schedules give the player even more reason to keep going back to see what’s new in town. Sure, you are Mayor and that does come first – but that duty only adds more incentive this time around to play everyday, as oddly enough – turning on this Animal Crossing for the first time starts a daily responsibility that never feels like a chore, but more like a relaxing vacation from reality. Those who already know what Animal Crossing is all about will get this, and should also be ready to revisit the staples of the franchise, such as the greedy Tom Nook, the wise yet a bit out there owl Blathers, and the menacing and ultra talkative Resetti, who still throws his classic fits for not saving after the appropriate unlock is made. 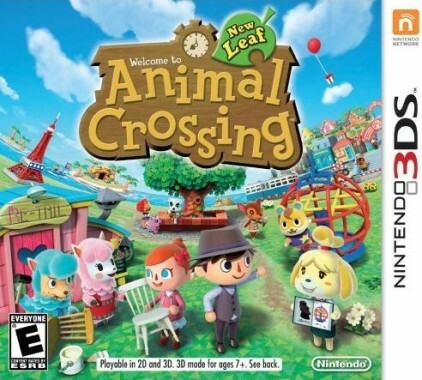 Those who are new to the series will find that New Leaf is the perfect place to start, as no title in the franchise has offered more entertainment or personality than the 3DS version. Sure, the villagers have fantastic dialogue and there is plenty to get out of the game, but what is new in New Leaf – gameplay wise? Well, as luck would have it – quite a lot. As mentioned, the first major change is your role as Mayor. With the help of Isabelle and the villagers, you can now customize your very own town by constructing projects at the price of bells. These projects will lead to new shops and areas opening up to expand your town a bit, as well as add to the fauna and scenery with park benches, fountains, lamps, clocks, and several other items that can be introduced to any open space. As you know, Animal Crossing runs off real time, so in order to craft these additions, the player must wait one full day after funding. The good news is that villagers themselves can contribute, as well as visitors via local or online play, making the growth take a shorter time depending on how many friends you have with generous intentions. Once complete, there is even a celebration for every landmark or project you finish, and that joyous occasion comes with great merit as these projects ensure that every town differs from the next, making each online journey to a new town feel all the more special. Also new this time around is a much stronger usage of online play. Up to three guests can visit a village of any town that has the gates open. This means that if your shops are a little barren or you just want to get some ideas from a friend, you can hop a train to their town and socialize with their villagers and do some shopping, with the potential to recruit new townsfolk or gain unique items such as fruit on each trip. Online play is not just restricted to exploration either, as the island makes a return and brings with it several activities for single and multiplayer fun. Each island has its own little shop, where the currency is made of medals rather than your standard bell. To gain these medals, players can take part in island tours with Tortimer, which act like mini-games based on the hobbies that your main town has already established. For instance, up to four players can see who can catch the most bugs, hunt for fossils, or go fishing to win medals, and win unique, island exclusive merchandise in the process. As players knock out these mini-games, new and more challenging tours open, with more rewards up for grabs upon completion. New additions aside, this would not be Animal Crossing without the economy in place, as everything revolves the almighty bell. Nearly everything you do in New Leaf consists of gathering bells, and the player must tap into their town’s resources to gain bells to upgrade shops, buy more items, and make that Tom Nook tent into a stunning castle. This is where the replay value in New Leaf truly comes in, as there is never a time where you will be left without a purpose to keeping collecting and selling off merchandise. Your own town comes with a town fruit from the start, and only by visiting other towns or doing good deeds for neighbors will you get to get the more rare foreign fruits to plant and make profit off of. Items such as fossils can also be dug up and sold at the local flea market, but beetle hunting may be the best and most addictive way to pay off those overbearing town costs in the quickest manner. Right outside of your little island, after the sun starts to set, rare beetles will start to come down and land on trees. 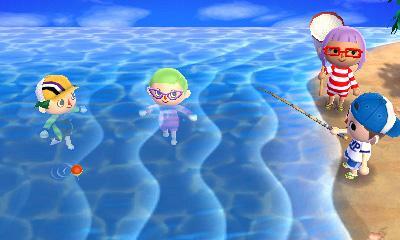 In order to take advantage of this occurrence, the player must get out their net and steady their hands, as these rare bugs go for upwards of 12,000 bells each. This sounds like a small task and isn’t even mandatory to gain funds within New Leaf, but during my time with the game, beetle hunting as become a full time job to raise funds and a quick way to earn cash to pay off old Nook. Thankfully, it never feels like a chore to do this, as catching the beetles requires a good amount of strategy and patience, with a little bit of timing and precision mixed in. Those who are trying to find other ways to earn bells can also collect art, head to the nearest stream to fish, or simply perform chores for villagers and hope the rewards will be worth their weight in bells. The economy in Animal Crossing keeps the game from getting dull, as there is always something to make better and to improve- more bells is always the answer. The well balanced assortment of activities to earn that dough will are more than enough to keep you busy however, and the high pressure of making the perfect town and retaining the title will keep you playing everyday. So what comes after the busy day, selling bugs, fish, and items? Quite a lot, actually. For entertainment, the player can visit the familiar face of K.K. Slider in Club lOl, who performs special songs depending on the day and is just as charming as he ever was with his offbeat selection of tunes. You can also test those art skills out in the design shop, crafting designs for t-Shirts, dresses, and eventually beds and furniture. To gain ideas, a trip to the Dream Suite will also hit the spot, as New Leaf uses this building to allow players to visit random or predetermined towns all over the world via the 3DS’ wi-fi capabilities. While in this dream state, players can not “grief” the town they are visiting as no damage will be left, even if you go wild with holes due or with an axe due to the clever “dream” state that your are entranced in. This mode is also what adds more relevancy to obtaining the perfect town, as once uploaded, your town can be voted on by visitors, which leads to rewards and of course priceless bragging rights. 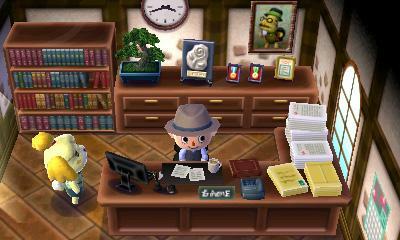 The beauty of New Leaf is that you can play for thirty minutes a day or for hours at a time, and still gain something new from each experience. There is never a demand to play, but the incentive is always lingering to go back in an check on the town you built, as every day brings about some kind of new interaction or opportunity to enjoy. Those who abuse the system with their 3DS internal clock may end up getting burnt out rather quickly, but the good little Mayors out there that take their time and cherish their creations are sure to have a home away from home, where life comes easier and free of worry aside from weeds and the occasional batch of bees that fall from trees. The online play opens up a world that the 3DS has yet to see as well, as QR codes can be used to share designs, and the next village is only one small train ride away thanks to the friend code system that works effectively at keeping those naughty Mayors at bay. 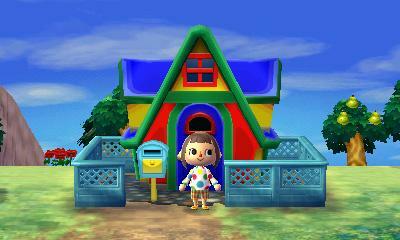 Animal Crossing: New Leaf is a game filled with color and life. The main objective of the game is to make your town beautiful, and that is entirely possible as there are dozens of vibrantly colored flowers and ripe, round fruit to plant, which create a stunning scenery. A lot can be also said about the sky itself, which changes from day to day. For a good portion of the time I played, it was raining – but that even has its own little beauty to it as the dark clouds roll in the background and rain trickles off your neighbor’s umbrellas to the brewing storm. Every town has a uniqueness as well, and the town layout of each ensures that no two towns look or feel the same. The customization of towns with Public Works Projects further that statement, as the little things like clocks, lamp posts, fountains, and fauna can be used to make your locale and stand-out resort, or a more cluttered yet livable city. A lot of the game’s charm can be found within the villagers as well, as they all have their own unique styles – and may even borrow eachother’s look from time to time once a trend takes the village by storm. Tank learns that revenge is a dish, best served cold. 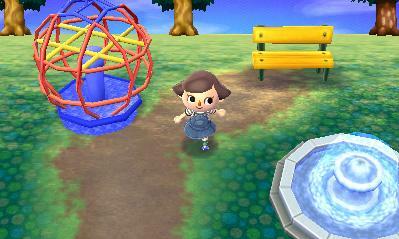 By far, the best quality about New Leaf comes in the sounds that this little game distributes. Animals all speak Animalese still, and the little squeaks or pounding chatter is enough to make even the coldest of men crack a smile as their little villager frantically tries to tell you what is on their mind. When they try to sing, well – that is enough to make one melt. The music, or the entire soundtrack I should say may be one of the greatest set of tunes to ever grace a Nintendo platform. 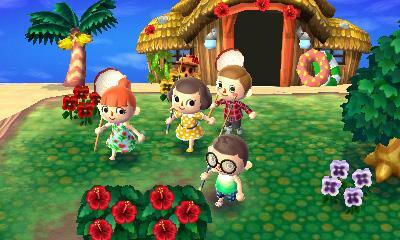 No melodies have ever produced as much of a peaceful and upbeat atmosphere as the joyous hymns found in New Leaf. This is the kind of music that doesn’t get you pumped up to play or take off like in a Mario game or other title, but lets you settle in and relax. In my opinion, that is an absolute achievement and something we don’t generally see as many studios try to blow their music load early, instead of giving the player a truly relaxing atmosphere to enjoy themselves in. For a game where a lot of time can be spent and after over 100 hours in the game for myself, I still love the music that New Leaf delivers every time I turn the game on, and the little extras such as the over 100 setlist from K.K. Slider just expand this library into what may be (arguably) greatest soundtracks of all time. What is perfection? That is a term used describe something with no flaws, bugs, or unredeeming qualities. Sure, Animal Crossing: New Leaf might have a few dull moments for some, but in my opinion it stands as the greatest entry in the franchise to date and one of the strongest releases on the 3DS thus far. Each day brings about something new, and there is always something to look forward to tomorrow. In the days where DLC runs rampant as developers try to keep their games relevant just days after release, New Leaf effortlessly stands as a complete package, bringing one of the most complete experiences we have had on a handheld since Pokemon. New Leaf is the game that all of the freemium iOS developers want to create, as it delivers so many options to the player but never charges a penny extra outside of asking price for an experience that comes off as unforgettable and filled with wonderful interaction and lovely memories. Animal Crossing has been around for over ten years now as a franchise and has always been full of potential, but this New Leaf turned brings about one of the most joyous and inviting installments, and does so by teaching the player that the wait will always be worthwhile.